Drill a hole, insert a wall plug, and then drive the screw into that. As the screw penetrates, the plug expands and presses against the sides of the hole. So long as you don’t overtighten it (in which case the screw thread will destroy the plug) the screw will then be very firmly embedded indeed. You must, though, ensure that the plug expands in solid masonry, rather than in the plaster coating, or in any mortar joins. 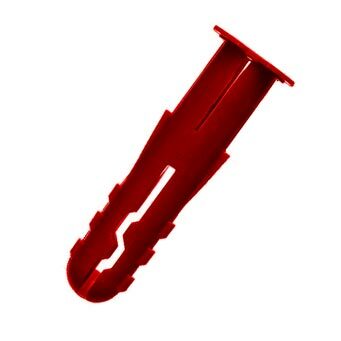 Made from plastic,these give a stronger fixing than strip plugs. Designs vary, but all have slits or opening jaws to increase the degree to which the plug can expand, as well as fins and barbs to increase grip. The other advantage of this sort of plug, is that, with most brands, one size of plug can take several sizes of screw, without reducing the fixings strength. A special version of the standard plug for fitting structural timbers like door frames. It has its own, built-in brass screw. Similar to fibre plugs, these are sold in 300mm (12in) lengths so you can cut off just the amount you need. Again, you must match the size of plug and the hole to take it, with the size of screw, and to help you the plug sizes are colour coded. White is for screw gauges 4 and 6 and needs a hole drilled with a No 8 masonry bit; red is for gauges 6 and 8 and needs a No 10 bit; green is for gauges 8,10, and 12, and needs a No 12 bit; and blue is for gauges 10, 12, and 14, and needs a No 16 bit.